Baxter Creek Trail has a well-earned reputation as one of the hardest hikes in all of Great Smoky Mountains National Park. Starting at the Big Creek picnic area near Waterville, NC it climbs more than 4,000 feet over 6.2 miles, roughly 700 feet/mile. That will get your attention. Look for stunning forest scenes, waterways that keep the forest green, seasonal wildflowers, and sweeping vistas from the summit of 5,842′ Mt. Sterling. Take plenty of food and water, and energy, because you will definitely need it. But also take your time and enjoy the backcountry. Ken and I tackled Baxter Creek on Tuesday, June 6, 2017 beginning at 7:45AM and ending about 1:00PM. My plan was to go until I was tired, then turn around. Ken had plans to make it all the way to the top and back. Hike Rating: Quite difficult. Prepare yourself for a long, relentless climb. Trail Condition: Good. Lower elevations are quite smooth and well maintained. The higher you get, the more rocks and roots there are to deal with, as well as plants encroaching on the trail. Starting Point: Picnic area at Big Creek on the NC side of the Smokies. Trail Traffic: There were two other solo hikers and a trio of NPS workers. How to Get There: From I-40, take the Waterville Road Exit (Tennessee #451). Turn left after crossing the Pigeon River into North Carolina and proceed 2.3 miles to an intersection with Mt. Sterling Road. Continue straight, across Mt. Sterling Rd. The Big Creek ranger station is on the right. Pass the ranger station and go another 0.4 mile to the parking area at the end of Big Creek Rd. The trailhead is across a foot bridge over Big Creek. Five years ago I wouldn’t have given a second thought to hiking all the way to the fire tower on the summit of Mt. Sterling. I was five years younger and hadn’t yet experienced energy-sapping hypothyroid. I am also admittedly not quite as eager to remain in shape as I was then (yes, a bit lazy in my old age), plus carrying an extra 15 pounds today as a result. So when I finally decided that I wanted to see what Baxter Creek Trail was all about, I went with the intention of not exhausting myself… of just doing what I could do and enjoying the experience. I took it nice and easy from the start, conserving energy along the way. I stopped frequently for pictures (as you will see in the gallery below). Whenever I spotted a comfortable rock to sit on, I availed myself of the opportunity to catch a breather. Ken, on the other hand, is still in top hiking condition. He decided after the first 15 minutes that he wanted to go for the top, so that’s the last I saw of him for the next five hours. Baxter Creek Trail starts with an iron foot bridge across Big Creek in the heart of the picnic tables found at the end of Big Creek Rd. The bridge offers a picturesque view of Big Creek in each direction, and it was particularly inviting early in the morning. Like a great deal of the Smokies, lumber companies tried to work these mountains in the early 20th century, but the steepness and rugged nature of the terrain made it difficult to get their harvest out. So they left quite a bit of the forest intact. What is great about that for you and me are the groves of old growth that still remain, giving us an idea of what the undisturbed environment looked like a hundred years ago. As you begin the hike on the east side of Big Creek, the first half mile is relatively flat, the only part of this trail that is. It follows Big Creek southward with a rocky, moss-covered escarpment to your left. This part is loaded with wildflowers in April and May, most of them clinging to foot holds on the cliff face. After a half mile the trail makes a subtle turn to the southeast and begins a gradual incline. You enter an absolutely stunning forest of tulip poplar and beech. I was in awe. The trail through this remarkable woodland is straight as an arrow. At times, you can see hundreds of feet ahead. Click the photo at the top of this post for an example. See Ken way up in the distance? As I cleared this area there was quite a bit of blow down from recent heavy wind storms that have plagued the national park for the last month. The National Park Service, however, is always johnnie-on-the-spot. There was a crew out before I got back down clearing away the worst of the fallen treetops from the trail. The NPS workers are special. Soon you reach the level of the cliff top and the forest becomes more diverse. In addition to very large tulip trees you will also find hickory, maple, dogwood and hemlock. Some of the hemlocks are still thriving, but many have unfortunately succumbed to the woolly adelgid blight that has ravaged the Smokies. Because I was now away from the roar of Big Creek, I also happened to notice a delightful cacophony of songbirds filling the timberland. The pathway through the lower forest is remarkably straight at times. 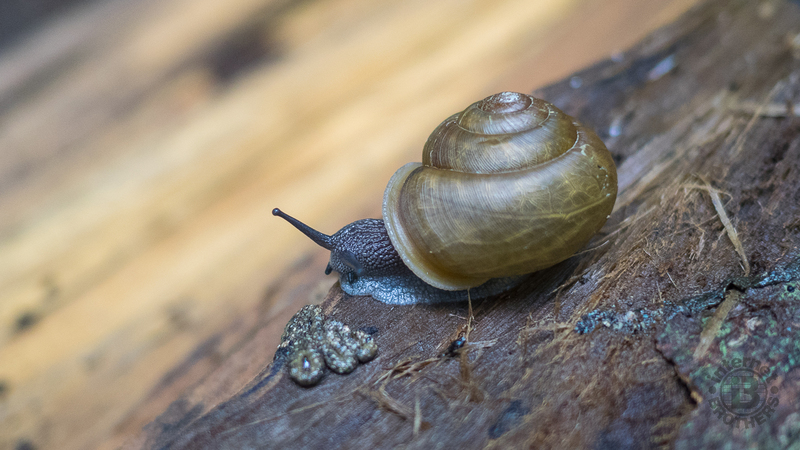 As I spent more time studying the ground at my feet, and alongside the trail, I noticed there were a lot of snails and centipedes enjoying their woodland home as much as I was. It’s funny how when you take your time and don’t hurry by, just how many of the micro sized things you notice. There are tiny plants and mushrooms, spiders and other crawly creatures, and lots and lots of moss and lichens. I imagined that I was having an entirely different hike than was Ken, far ahead. Look for a spur trail on the right that goes about three-tenths of a mile to an old homestead. All that remains today is a stone chimney on the bank of the creek and a few rusty artifacts, but I suspect it was a beautiful place to live a century ago. Soon after there is an amazing patch of ground pine lining both sides of the trail, and along with a variety of ferns, filling the forest understory. Soon you will get your first introduction to one of the branches of Baxter Creek, the namesake drainage for this trail. This is absolutely nothing like the appropriately named Big Creek. Think small, babbling brook. But you will begin to hear it a few hundred yards before you arrive. You rock hop across the creek and immediately begin a much steeper climb. Steel yourself, because it is now steeper the whole rest of the way. The trail now also gets rockier and more rooty, narrower and occasionally infringed by growing plants. So in addition to the extra exertion, there are also now more hazards. The good news is there are also occasional brief glimpses through the trees of the surrounding Smoky Mountains. On this day, the early morning mist was still trying to rise from the valley floors creating a mysterious scene as I wondered if there was anyone out hiking way over there. The landscape becomes a field of boulders, each with its own micro garden of ferns, lichens, moss and sedum. I was fascinated by the many little botanical displays that kept my camera busy. After a second rock hop of another branch of Baxter Creek, there is another opening in the trees. When the leaves are down you can see Mt. Cammerer from here, and even the power plant at Waterville. The trail also makes a couple of long, sweeping switchbacks, turning first due west, and then back to the southeast. I encountered dozens of these little guys throughout my trip up the Baxter Creek watershed. You will pass through the first of several rhododendron tunnels, then reach another massive cliff at the two mile mark. A few of the rosebay rhodies were already in bloom here and Ken told me later that the catawbas were in bloom up above 5,000 feet. Speaking of wildflowers, at the time of our hike in early June, the wild hydrangeas were in full bloom, as were the galax racemes. I even noticed some whorled loosestrife, a new flower for me. Look for another rhodo tunnel on the other side of the cliff as well as a few Fraser magnolias. You will hit another quite steep stretch, then enter another rhodo canopy. You can tell this used to be chestnut country as a couple of old snags still sit right along the side of the trail. As you continue to rise higher and higher above the cliff and leave the rhododendron thickets behind, the trail becomes more relentless as the forest becomes denser and denser. The occasional rocks to sit on are fewer and farther between. I was beginning to get fatigued. I was hoping for perhaps an overlook, or a clearing with a nice log to sit on for a rest. Not to be though. On and on I went, intrepidly forward. Step by step, foot by foot, pausing occasionally for a picture or a big breath of thinning air. I was now more than 2,000 feet above the trailhead. I began to notice the first spruce trees, always a sign that you’re getting to a pretty high elevation. Speaking of spruce, here’s an interesting bit of botanical information: Do you know how to tell a spruce from a fir or from a hemlock? Well, grab one of the boughs. Spruce needles are sharp enough to prick your fingers, whereas hemlock and fir have a softer feel. Here’s another way: roll a needle between your thumb and forefinger. Square spruce needles roll easily, while the flat fir and hemlock needles won’t. Ok, back to hiking… or in my case, deciding that it was time to turn around. I had enough of the up for one day. Time to look at my GPS tracker. It said I was 3 hours 15 minutes into the hike, had gone 3.7 miles and had climbed almost 2,200 feet. As I doubled all of that in my head, I thought that would do. Much farther and I would be really tired by the time I got back down to the bottom. However, let me take a moment to tell you what is left if you want to go the last 2.5 miles and another 2,000 feet up to the summit of Mt. Sterling as Ken did. At four miles and beyond you pass through another boulder field and another series of switchbacks. You then enter a mostly spruce and fir forest beyond five miles, eventually reaching the ridge top. At 5.9 miles is a spur trail to a spring. This water supply is handy for those who camp at backcountry site #38 on the summit. The last quarter mile is along the ridge to a fairly large grassy area at the top. In addition to about a dozen campsites, there is an old CCC 60′ fire tower. You can climb the tower, but it is becoming more and more rickety with age. Ken said a crew was up there replacing the electrical system with solar panels, a move that will improve the overall ambience. You can learn more about the summit of Mt. Sterling here, my previous report for a different trail that reaches its peak. The views are incredible in every direction. You can see many of the famous Smokies landmarks that you have visited on the myriad of trails. You also have the option of continuing on the Mt. Sterling Ridge Trail to its meeting with Swallow Fork Trail and Walnut Bottom, an alternate means of getting you back to the start at Big Creek. Be forewarned though, that it is quite long and arduous. Obviously, my return and Ken’s return were different. He had quite a bit farther to descend than did I. So I continued to take my time, giving him a chance to catch up. Still, the descent for me took only two hours. Ken must have really been moving though, because he rejoined me at the picnic area just 45 minutes after I finished. When all was said and done, when I turned around, I felt like I still had enough energy left to climb the rest of the way to the top of Mt. Sterling. Getting back down, though, would have been the problem. For me anyway, it’s a long, hard day hike. If you like to camp… so much easier. Or, you can consider a shuttle hike that goes up the Mt. Sterling Trail, then down Baxter Creek. 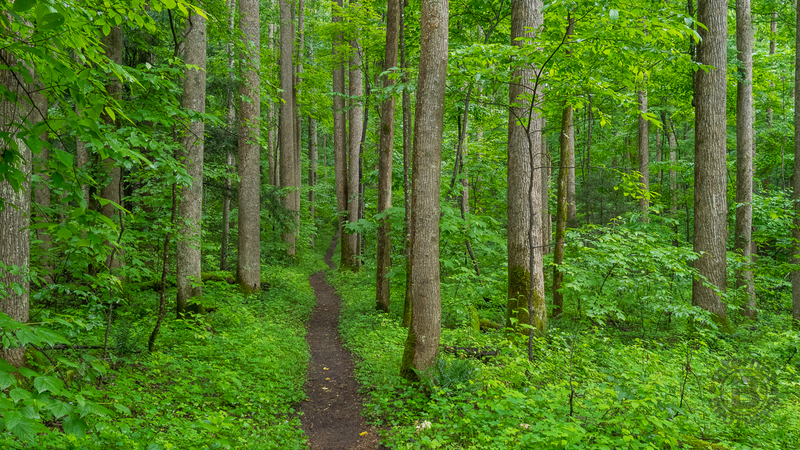 Summarizing, if you do the 12+ mile round trip, Baxter Creek is indeed one of the more difficult trails in the Smokies. It isn’t the length, necessarily, that will get you. It’s that 4,200 feet of up, and then back down. Consider that when you are planning this adventure. You have many options. Reserve a site at backcountry #38 and make it a two day trip, or, just enjoy a part of Baxter Creek Trail like I did. Having already been to Mt. Sterling, and knowing what that was all about, I still had a great time on the 7.5 mile circuit of Baxter Creek that I did. Could it get much greener? Update March 29, 2019: I made another trip to Baxter Creek Trail, primarily to check out the blossoming spring ephemerals. The reputation for a wide variety of wildflowers did not disappoint as you will see from the new gallery below. If you’re looking for a low elevation flowering spot in the Smokies for late March to early April, keep Baxter Creek Trail in mind.